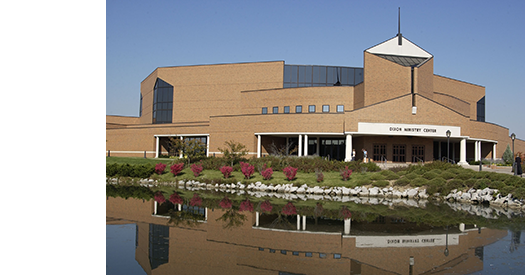 Completed in 1996, the Dixon Ministry Center houses the James T. Jeremiah Chapel, the Bolthouse Center for Music, and the Reese Center for Christian Ministries. The building was named in honor of President Paul Dixon for his leadership of the university since 1978 and for his emphasis on daily chapel for the entire college family all in the same building. The original 2000-seat James T. Jeremiah Chapel was completed in 1976 (see the Apple Technology Resource Center. The trustees voted to name it for Dr. Jeremiah “as a tribute to his firm defense of the college’s doctrinal position as well as his deep concern for the spiritual growth of students” (Torch, July 1978).The need for a new chapel was evident as the student body had outgrown Alford Auditorium and the short-term solution of two chapel services pleased no one. During the 1975-76 school year, the Student Body Project challenged student/faculty/staff teams to raise $40,000 to purchase the pews. One of the fund-raising activities was a Walk-a-thon in which participants solicited sponsors to pay a certain amount per mile and participants walked fifteen miles from Cedarville to Springfield. A grand total of $45,000 was raised. When the architectural plans for the chapel were shown to the trustees, some of them objected, doubting that the student body would ever reach 2000, but Dr. Jeremiah was ever the visionary and had no doubt that Cedarville would continue to grow. Not only did the student body reach 2000 by 1991, it soon became apparent that the college would have to plan for a larger chapel because it had become necessary to implement remote broadcasts with upper-class students assigned to “attend” chapel in various classrooms on campus. The Dixon Ministry Center, completed in 1996, then housed the new 3400-seat James T. Jeremiah chapel. The carillon system of the original Jeremiah Chapel was donated by Dr. Pam Diehl Johnson in memory of her grandmother and by Dr. Delyte Morris in memory of her mother. The carillon system was installed in the Dixon Ministry Center when that building was completed. The Bolthouse Center for Music, which houses the facilities for the Department of Music and Worship, is named in honor of trustee Bill Bolthouse and his wife, Nora, of Bakersfield, California, for their support of the university and their exemplary Christian testimony. Bolthouse served as a trustee of the university from 1996 to 2013. The 42,000 square feet of space devoted to the Music and Worship Department includes a 250 seat recital hall, 20 practice modules, separate instrumental and choral practice areas, studios, and offices. The Reese Center for Christian Ministries honors Robert P. “Bob” and Polly Reese of Elkhart, Indiana. Mr. Reese was employed by a number of different companies as a tool and die engineer. Later, he worked with his father in Reese Products making towing equipment for travel trailers, with manufacturing plants in Canada, Australia, and the United States. He followed his father as president of the company, retiring in 1974. Mr. Reese was an active member of First Baptist Church of Elkhart and was on its board for many years. He also served on the boards of the Association of Baptists for World Evangelism, Los Angeles Baptist College, Stewardship Services and ChristWay Ministries. Both Bob and Polly were known for their active interest in missions and in diligently serving at their local church.